For a long time, I allowed the cake truffle to remain a mystery. I didn’t want to uncover how the cake got into the chocolate- simply thinking about it blew my mind. I decided they just existed that way naturally. But then, I started seeing them popping up all over my favorite food blogs and then Pinterest, and my curiosity got the best of me. I had to know how they got the cake inside that chocolate. Turns out, it’s pretty easy. I read a few blogs to compare techniques and decided to try my hand at making some this past weekend. I love red velvet cake (and I don’t throw around the word “love” lightly- red velvet is hands down my favorite cake flavor and I will go out of my way to consume it on a regular basis), so it was a no brainer for me to choose red velvet cake for my “insides.” I referenced a few blogs, mixing and matching the parts I liked best from each, went to the store, came home and got to work. 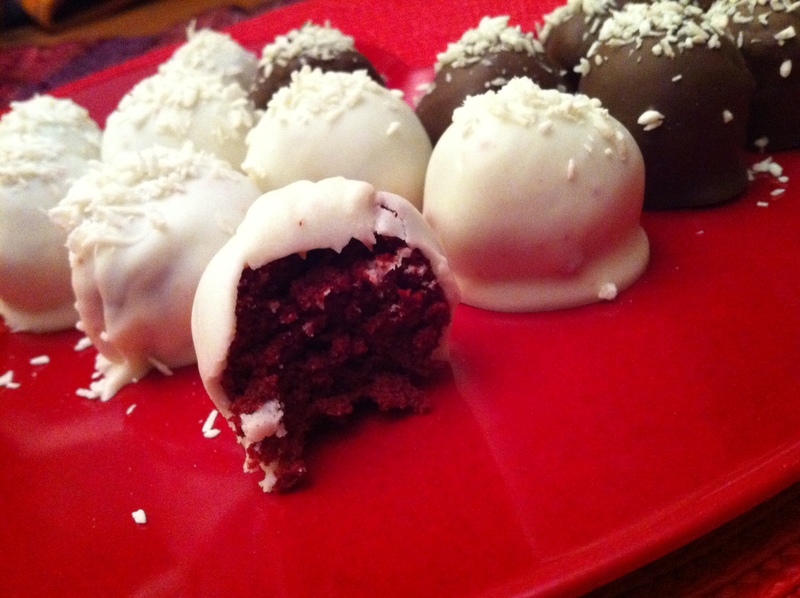 Several hours later and a whole lot of mess in the kitchen, I had about a dozen beautiful red velvet cake truffles. And they taste even better than they look. My only issue now is NOT consuming every last one of them. Prepare cake according to package instructions. Allow cake to cool completely. I put mine in the fridge to speed the process. Once cooled, cut off any hard or crusty edges. Crumble cake with your hands in a large bowl until it is broken down and fine. Mix in 1 container of cream cheese icing. I found it easiest to use my hands to do this even though it was extremely messy. Mix icing and cake until it has reached a consistency of a nice, even dough. Roll the mixture into 1/2 inch balls, using your hands, and place in the freezer until chilled but not frozen. Melt chocolate according to instructions on the package. I used the microwave and it worked fine, but others may prefer a double broiler method. Once the chocolate is melted, remove the balls from the freezer and dunk them one by one into the chocolate until covered. This process is a bit tricky, but I discovered it’s easiest to dunk the balls in the chocolate and remove with a small fork, allowing the excess chocolate to drain off before placing them on a a cookie sheet lined with parchment paper until hardened. 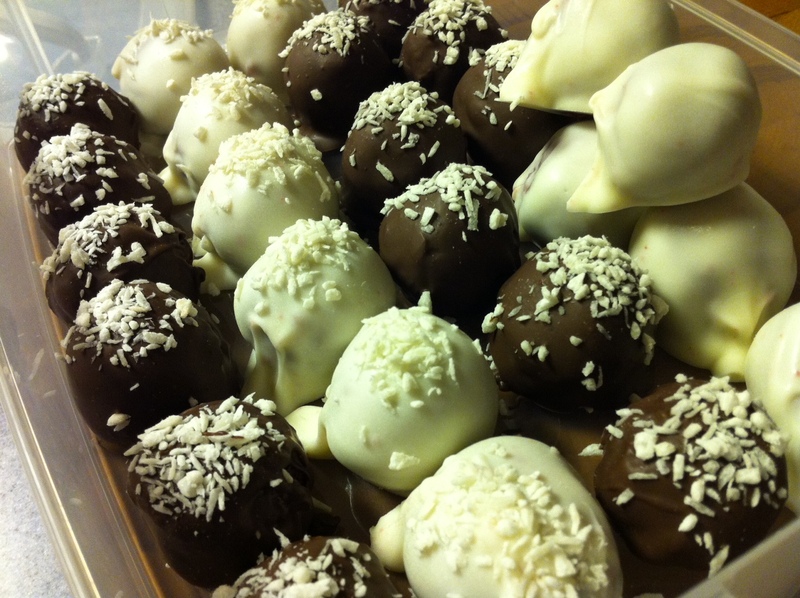 If you want to add embellishments to your truffles (I used coconut), you must do so immediately or the chocolate will harden and they won’t stick. Voila! Done. Super fancy and super delicious!